Recently I did a review of my wonderfully comfortable pair of SKECHERS Skech-Air Shoes, I LOVE them and they saved my feet on our recent vacation. Not only were my feet exceptionally cozy but my hubby’s were as well. He received the SKECHERS Men’s Synergy Over Haul Athletic Shoes for review and also wore them on our trip to put them to the ultimate test. The SKECHERS Mens Synergy Over Haul Athletic Shoes have the same memory foam that the Skech-Air shoes that I have do and they really did a wonderful job of cushioning and supporting his feet during our miles and miles of walking. The style of these shoes is very nice and versatile. You could wear them with your workout gear, a pair of shorts in the summer or jeans in the fall and winter. There are a variety of colors to choose from and hubby went with the charcoal and red. The Men’s Synergy Over Haul shoes are also really lightweight making them great for long time wear. My husband has really bad knees from his teenage skateboarding days and often times when we go walk long distances his knees really start to bother him. I was worried that this trip and 4 theme parks would really do his poor knees in but, surprisingly, there wasn’t a day when they bothered him! I know had he worn any other pairs of his shoes and they would have been killing him so we owe that to the SKECHERS Synergy Over Haul shoes. Honestly, I won’t try another pair of shoes for any of our long walking trips to the theme park or around the neighborhood. I trust our SKECHERS to keep us comfortable and, of course, stylish too. For all the latest deals, promotions and updates connect with SKECHERS on Facebook, Twitter and Pinterest. 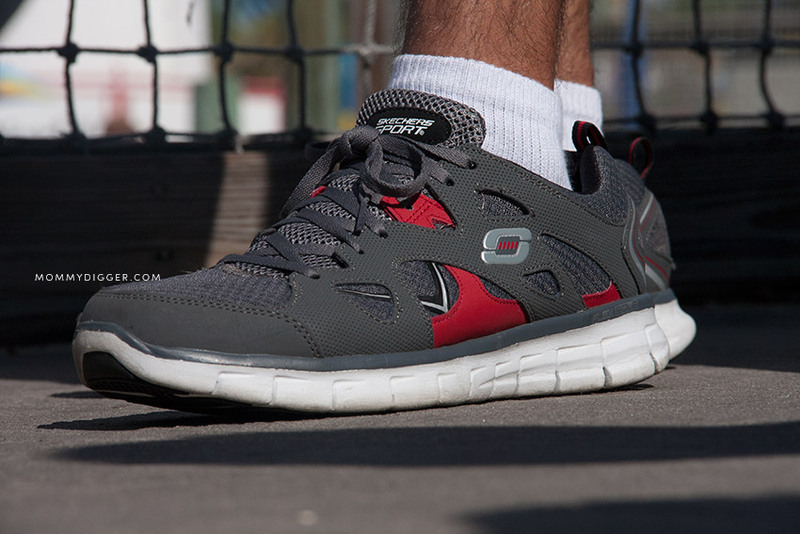 BUY IT: SKECHERS Men’s Synergy Over Haul Athletic shoes are available on the SKECHERS website. My husband received a pair of SKECHERS Men’s Synergy Over Haul Athletic shoes to facilitate this review. All thoughts and opinions are our own. These sound like the perfect shoes for my son-in-law who has bad knees too. He works standing on his feet all day and comes home with his feet and knees really hurting. I will pass this along so he can check into these shoes. These looks like very comfortable shoes. Perfect for days with lots of walking involved! Great post! My husband would love something like this! These are super nice looking shoes. I love Skechers, I wear them all the time. i love sketchers. never thought of them for men, but they look great ! :) nice pics too! Those do sound like good shoes for big walking days. Which means they also would be good on regular use days. I like comfortable shoes.